The fabric is stretchy. Length/from shoulder to hem/ - 27". Waist/from side to side/ - 23". Perfect Plus Size Closet. Item must beUNWORN ,UNWASHED, haveNO smoke odor orPET hair. Laura Scott Lace Front Tee with lace overlay. "Paradise Pink" color. shoulder to bottom of hem 30". Laura Scott size 1X cotton shirt with beautiful purple floral pattern on white. Beautiful women's blouse pre owned in excellent condition , short sleeve, small pleated, sleeve 10", front length 28" , chest 27"
Ladies Polo Shirt. Plus Size 3X. Laura Scott Fashion. Color: Navy Blue. Fabric: 95 % cotton 5 % spandex. Ladies Knit Top. Fashion by Laura Scott. Care: Machine wash/ dry. 3/4 Sleeve. Fabric: 100% cotton. Color: White. This one-piece top appears to be two pieces. The rounded neck inner section has round “silver” beads creating a design descending from the neckline, and the outer section is long-sleeved with an open front. Top of shoulder to bottom hem 29". See through or sheer top blouse in multicolor black with red, beige brown floral print or flowers pattern. In excellent NEW condition. Material is 70% Polyester 30% Rayon. We only have ONE PIECE of this item! Floral button down top from Laura Scott. - 2 Buttoned Flap Chest Pockets. - Convertible Roll Tab Sleeves. - Machine Wash. - Blue, Green and White Cotton Stretch Fabric with Solid White Knit Side Inserts. Has a shirt sewn into the interior of the blouse (see pics). THE SIZE IS 1X. MADE OF 53% COTTON, 47% NYLON. NICE TOP AND A GREAT BUY! 28" TOTAL LENGTH FROM SHOULDER TO BOTTOM. Ladies Knit Shirt. Plus Size 3X. Design: Floral. Color: Pink. Care; machine wash/ dry. Laura Scott Fashion. Ladies Knit Shirt. Plus Size 3X. Fabric: 82% cotton 18% polyester. Care; machine wash/ dry. Laura Scott Fashion. Short Sleeves. 21 shoulder to shoulder. 27 total length. 28 pit to pit. Lightweightand airy, this Laura Scott Blouse is perfect for all seasons. Long sleeves, button up. 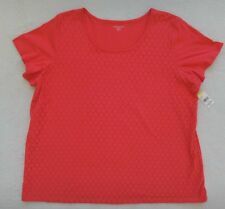 SEMI-SHEER TOP SHIRT BLOUSE ~~~ SIZE 20/22W ! Quality, Comfy, Soft silky satiny woven stretch fabric, Tapered waist, Darted bust, No pockets. MAY RUN BIG MAY RUN SMALL MAY RUN JUST RIGHT. Machine Washable 96% Polyester 3% Spandex 1% Other Fiber Exclusive of Decoration. Laura Scott t-shirt/pullover top in a soft pink and white floral pattern. 100% cotton, nice stretch. Shoulder to hemline: 30". Knit construction. Care: Machine wash. Fabric: 100% cotton. Laura Scott Fashion. Plus Size 3X. Ladies Knit Shirt. Care; machine wash/ dry. Fabric: 100% cotton. Color: White. This shirt is approx 30" pit to pit. With a scoop neck and slightly flared hem. Crafted from stretch, all-cotton knit with a smooth finish. Ladies Tank Top. this tank is an essential basic. Fashion by Laura Scott. Fabric 100% cotton. Color: Tango Red. Color, Cream, Light Pink, Black, Rose, Red and Apple Green. This is a button down blouse with white button. All buttons are in tact. It has small pleats in the front. Each sleeve has a white button. In nice clean gently used condition. Top of collar to hem is 26. Simple short sleeves and a crew neck keep the fit comfortable. Knit construction. from the back of the neck to the bottom is also 26". Short sleeves. Fabric: 100% cotton. Laura Scott Plus 1X Black Textured Short Sleeve Button Down Shirt, excellent condition. 27" long from top of shoulder seam to hem. Knit construction. Short sleeves. Fabric: 100% cotton.